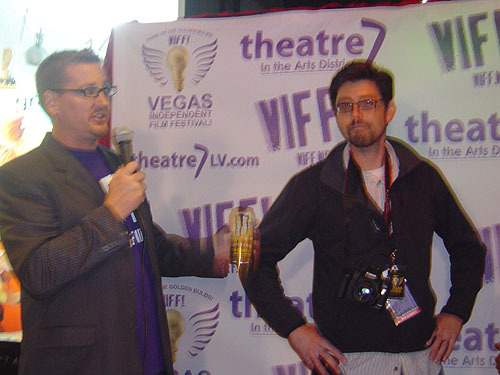 On Saturday, May 5th at 5pm the Awards Ceremony for the winners of this year’s Las Vegas 48 Hour Film Project were held at Las Vegas Event Producer Derek Stonebarger’s Theatre7 in the downtown area. Mike and Jerry Thompson from Light Forge Studios won the top prize for Best Film for the second year in a row with the “Super Awesome Buddy Squad”, which also took honors for Best Special Effects, Best Graphics and Best Directing. 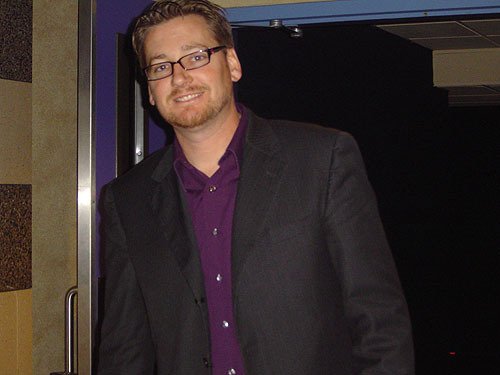 “Under the Christmas Tree”, was the Runner Up for Best Film and also won for Best Musical Score, The Second Runner Up for Best Film was :”Legacy” and Jason Briggs took Best Supporting Actor honors for his role in it. “Bug Complex won for Best Use of Line and snagged the Best Actress Award for Sheila Conway. “Running on Empty” was another multiple winner being acknowledged for Best Use of Genre, Best Editing and Best Ensemble Acting as well as scoring the Best Actor Award for Sean Morelli. “Hostile Takeover” won for Best Use of Character, “The Divorce” for Best Use of Prop, “Ned Chuttington Day: The Movie The Trailer” for Best Costumes, “The Bump” for Best Cinematography, Half Way There for Best Sound Design, Sherlock Homeless & The One Percent for Best Writing, and “LARGE COFFEE…BLACK!” for landing the Best Supporting Actress Award for Morgan Bastin. Honorable Mentions for Best Use of Genre went to “Broetry,” “Running Through Shadows,” and “The Grimace”. This year’s Audience Awards went to “The Listing” in Group A, “Super Awesome Buddy Squad” in Group B and “Sherlock Homeless & the One Percent” in Group C.
As usual Stonebarger and this year’s judges, local filmmaker “You People” Director and Indie Film Factory Founder Kelly Schwarze, Producer Christopher Webster (Hellraiser, Heathers) and Patty Fantasia, Film Blogger and VP of Marketing & Promotions for Jeff Grinstein Entertainment’s “Curvy Fashion Show”, tried to ensure that awards were distributed among a number of entries and that new filmmakers also had a shot at winning. However, the Thompson Brothers claimed the Best Film Award once again this year after being the 2011 winner for “The Wrong Taco Shop”, which also landed them a screening at the Cannes Film Festival. Stonebarger was also surprised that two of the top teams didn’t make it into consideration. The Ruse Films turned in their movie late and Byer Films didn’t submit their project at all. “That was a total shock to most in the competition as they’ve both won in the past,” Derek said. Prior to the announcement of the winners all of the films were screened over a two night period on Wednesday, April 18th and Thursday, April 19th at Sam’s Town, an event that was open to the public. Other sponsors included The NAB Show, Nevada Camera & Lens, Friday’s, Century Theatres, First Friday and Maxx Digital. Derek added that Nevada Camera & Lens gave out $300, $200 and $100 to the top three films selected by the judges and a $4200 red epic camera rental package to the team of their choice. Speaking on behalf of Nevada Camera & Lens, filmmaker Josh Cohen shared that the lucky winners were the Thompson Brothers from LightForge Studios. He added that since there is a lack of proper camera and lens equipment rental houses in Las Vegas, they are trying to help fill that market void by providing a single source where gear can be obtained by incoming companies. For those unfamiliar with the 48 Hour Film Project, it was launched in May 2001 when Mark Ruppert came up with the idea of trying to make a film in 48 hours. Enlisting his filmmaking partner Liz Langston and many other DC filmmakers the group formed their own team and began the experiment trying to figure out if films made in just 48 hours would be watchable. Now, over 10 years later more than 400 competitions have taken place worldwide with 2012 marking the 11th time the Project has visited Atlanta, LA, New York and Austin and the 14th time for DC. Teams have varied from 1 person being the smallest and 116 people and 30 horses on a team in Albuquerque being the largest. The Project consists of teams writing, shooting, editing and scoring a film in just 48 hours beginning on a Friday night when they are given a character, a prop, a line of dialogue and a genre, all of which have to be included in the movie, which must then be completed 48 hours later. This year in Las Vegas the required elements were: character – Nick or Nora Chuttington, Member of the 1% (millionaire/billionaire), prop – a belt and line – “We have to be quick”. In 2011, nearly 60,000 filmmakers made 4,000 films in 96 cities on 4 continents and the numbers continue to grow.